I can't believe it's been 6 months since I started the What's Wrong With This Picture thread but I guess life just got in the way. I haven't been idle though. In fact, I have (well had) a working prototype of the XY gantry. It was my intention to vlog the build process but I was experimenting so much that the video production was just a big hassle. Since I wanted to tear the prototype apart and rebuild it anyway, I decided to just do a "phlog". To recap, this is my "HyperCube OverKill" with the trademarked "Cartesian Renaissance" kinematics. And here's the plastic it took to get this far. So... This is the XY gantry only. I wanted the build to be as modular as I could reasonably make it so changes would be easier. 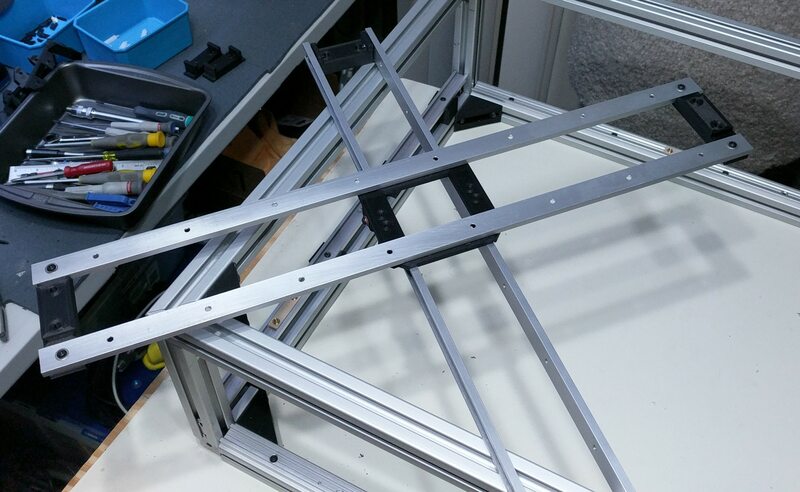 The intent is for this assembly to drop into the top of the outer frame which would contain the Z axis build platform. Since the XY gantry is where all the "new" work is, I wanted to make sure it worked by itself before mounting it in a big frame. All of the parts will be listed as I do the rebuild. 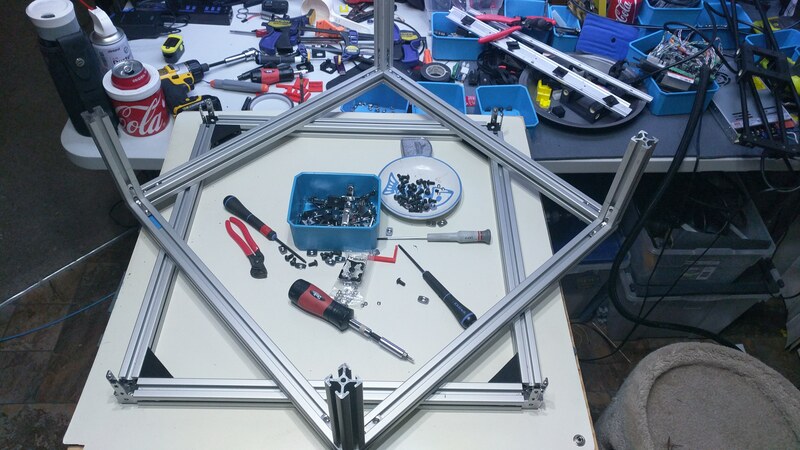 The interior of this frame measures 450x450mm with a printable 350x350mm area. Yes, there are 4 motors, 2 per axis. Don't get excited. It works and it allows for NO complex belt routing. Each motor (400 steps/rev, 46Ncm torque) drives 1 side of its respective axis. The stationary rails are Igus Drylin N series rails with overmolded carriages. 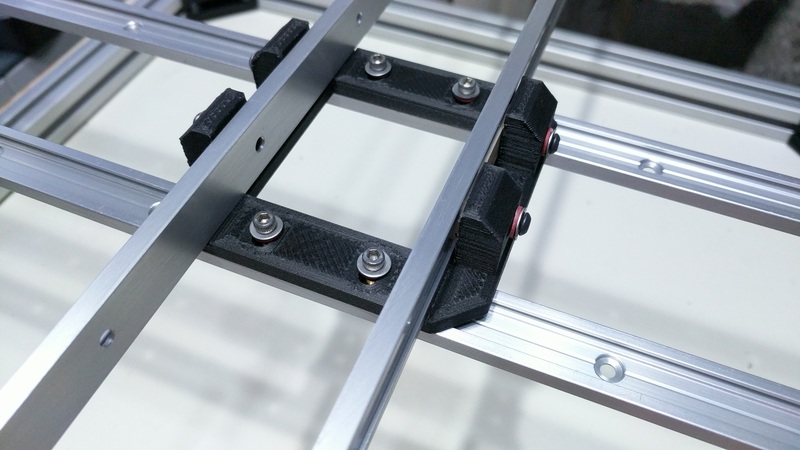 The moving rails are 10mm roll-wrapped carbon fiber. 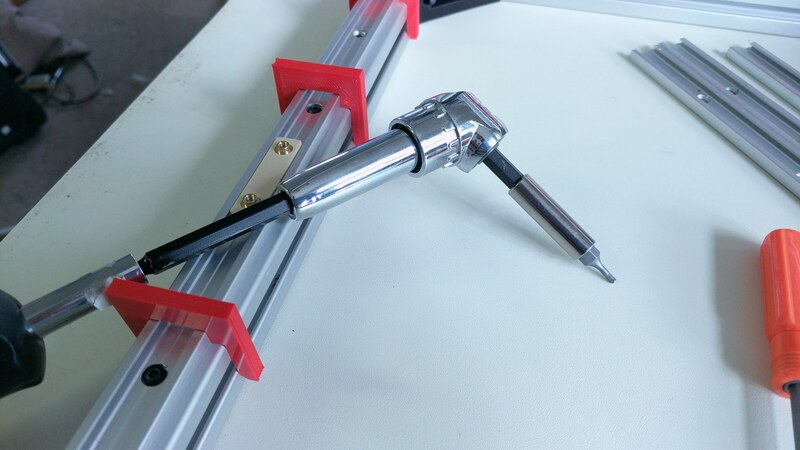 The tool platform has 10mm Igus sleeve bearings press fit into 12mm holes. This thing is dead quiet and with the motors holding the rail sliders, the tool carriage has not one speck of play in it. The moving mass totals out at around 290g, without hotend, etc. The electronics are simple for now... a Smoothieboard with 5 onboard drivers. 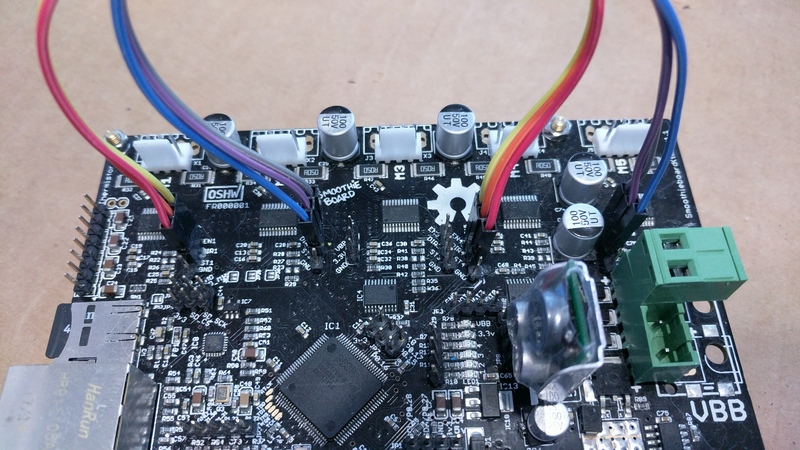 The logical XY axis outputs are bridged to 2 onboard drivers for now. Later, I'll use external TMC drivers but this was a simple way to get running. Although the motors are rated at 2 amps, each only has to do half the work for it's axis. Even so, the Smoothie can do the 2 amps but I've been running them at only 1 amp just fine. Of course it can't print anything at all but I have run many torture tests that just print in the XY plane including several overnight tests at 20000 mm/min that scared the bejezus out of the cats. The rolling table the assembly it's sitting on always wound up several feet from where it started but as far as I can measure (~1mm), the tool platform always would up exactly where it was supposed to and nothing caught fire. There are still things I want to change which is why I did the tear down. Re-assembly and details will start in the next post. Oh, I did make 1 YouTube video at least proving it's alive... HyperCube OverKill: It's Alive! Edited 2 time(s). Last edit at 01/30/2018 08:07AM by gtj. The video OTOH looks very good. Edited 1 time(s). Last edit at 01/30/2018 03:52AM by o_lampe. Photobucket is a joke. Moving pics. The extrusions are the 8020 Inc 25 Series. I chose them because it offered the best balance of size availability and cost. These rails are 25mm square but the outer frame will be 50mm square for the posts and 25x75 for the rails. The pieces were cut perfectly and came in only a few days. The connectors I got from OpenBuilds because getting them from 8020 would have cost more than the extrusions. They're not a perfect match, but they're close enough that they work. I did get a bag of longer set screws though because in some cases variations in the plates meant that the screws they came with bottomed out before fully tightening. The corner gussets I just printed out of PLA. The tee nuts I got from OpenBuilds aren't the drop-in kind so they had to be slid in from the ends. Holding them in place while tightening took a little help. 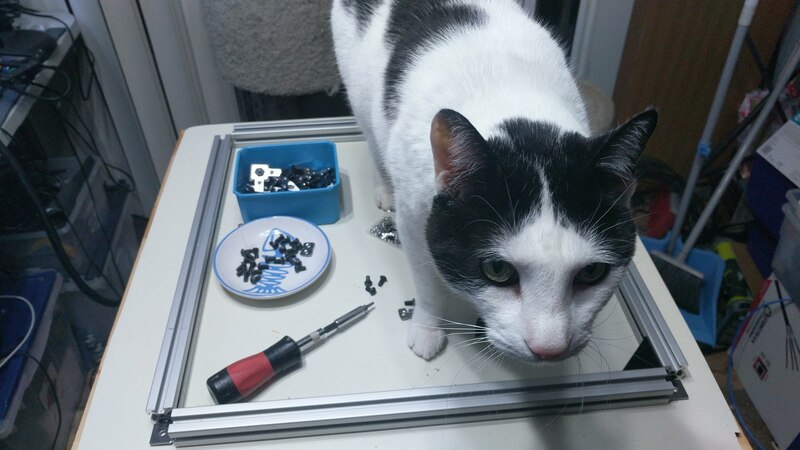 ...was a big help. 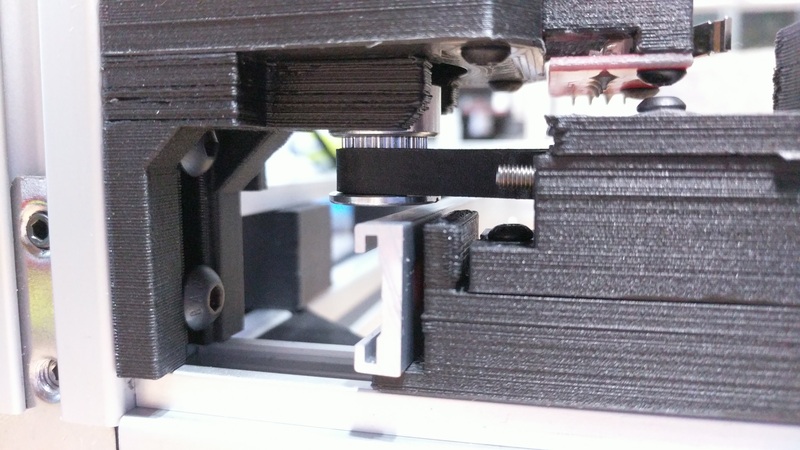 In fact, I printed several jigs and gauges along the way to make things easier. The rest of the frame was pretty simple. The difference is that the top set of rails are mitered instead of square cut. I did it this way just to see which I liked better. In the end, the square cut method offered more joining options so I'll probably replace the mitered rails later on. This is actually the underside of the upper rail assembly. Because those corners are mitered, I had to use the inside corner connectors to connect the posts. 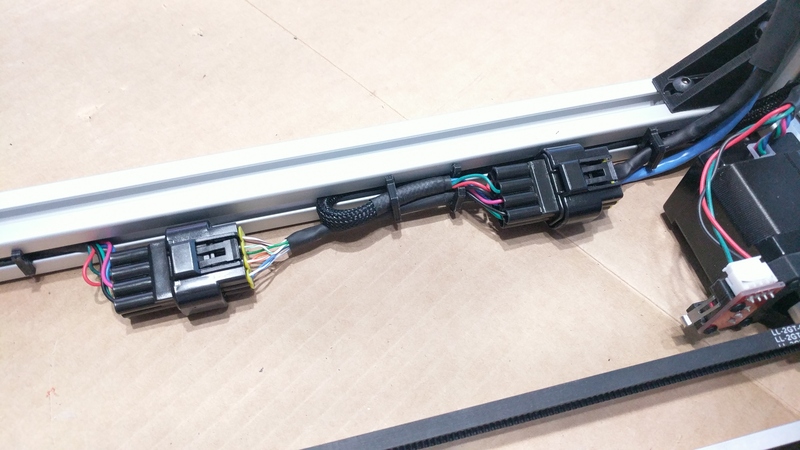 I didn't want to do this on the bottom rails because those connectors would interfere with the linear rail, motor and idle pulley mounts. 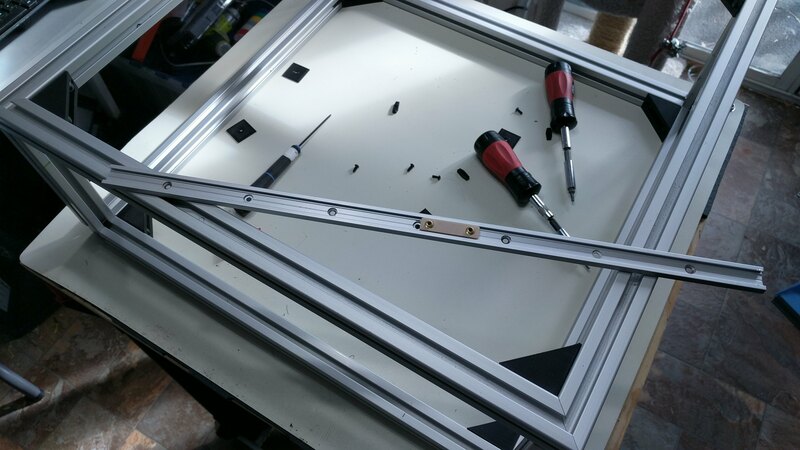 You can see here that the slots in bottom rails and the lower portions of the posts are clear to allow mounting the other components. Edited 1 time(s). Last edit at 01/30/2018 01:34PM by gtj. Now things start getting interesting. The perimeter rails are the Igus Drylin N 17mm Series. 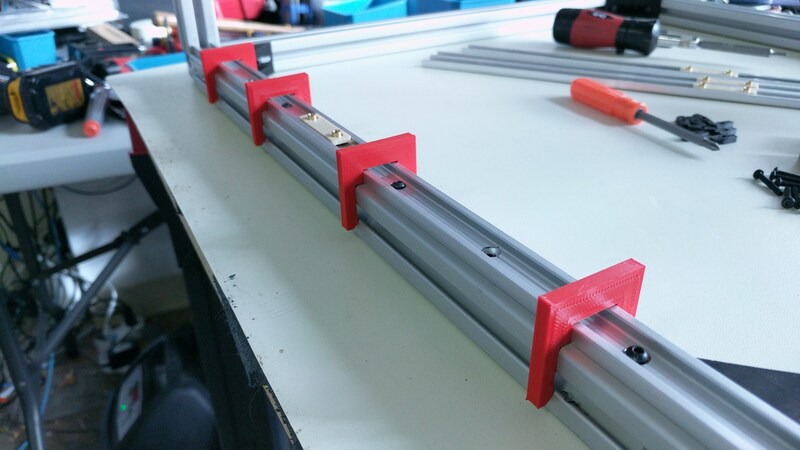 The rails are 450mm long to fit between the corner posts. The carriages come in 3 lengths (20mm, 30mm, 40mm), each with 4 sizing option (no float, float Y, float Z, float YZ). I chose the 40mm non floating ones. With just a light flick of the finger you can send one down the rail and have it bounce off the other end yet they have no more play than an LM series bearing on a rod. 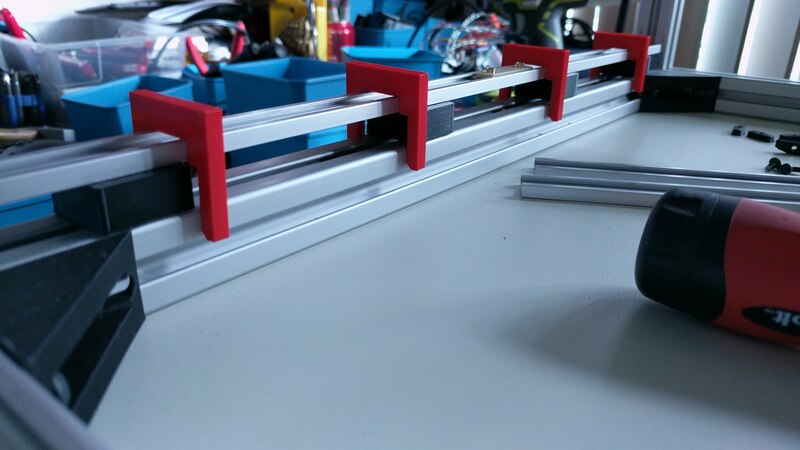 The rails came cut perfectly at 450mm. I made some jigs to center the rails on the extrusions. Much easier than measuring and trying to hold them in place while fastening them. Speaking of fastening, I made some carbon fiber M3 T-Nuts to hold the rails down. 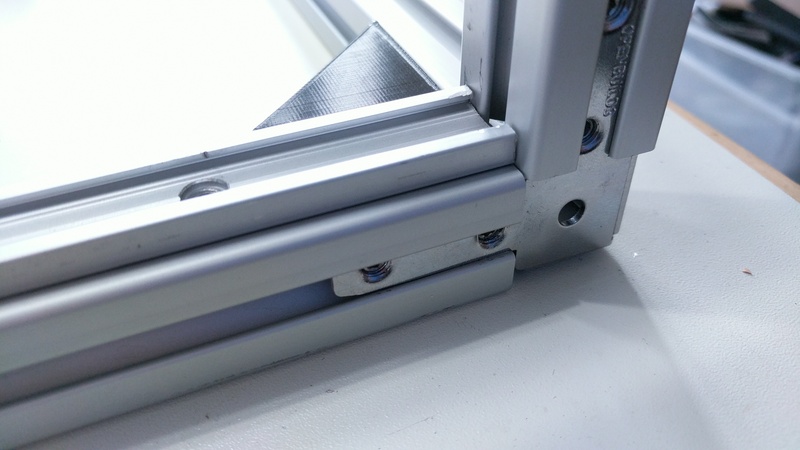 There isn't much clearance between the rail and carriage so you have to use button head screws with shallow heads. 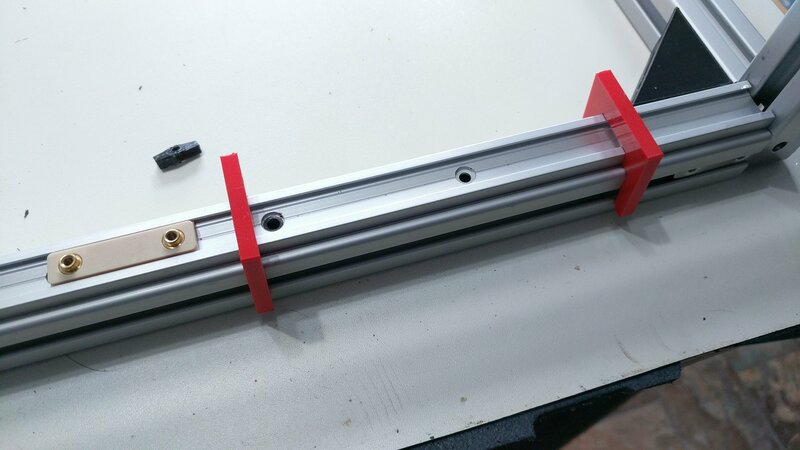 The Y and Y1 rails are higher than the X and X1 rails to account for the cross rails having to clear each other so I just printed some spacer blocks. Having a right-angle driver attachment is essential for working in tight spaces. Final note on the perimeter rails... Don't be an idiot like me and forget to slide the carriages onto the rails before screwing the rails down!!! I think I did that at least 4 times. A quick note about Igus... Even me being just an enthusiast, they were very helpful during all my iterations using their bearings and my surfaces. Their chat folks know everything about their products and I was always treated as though I were a major corporation instead of a guy who was going to spend only $100. Speaking of spending, after my first credit card order, I was able to ask the chat guy for an e-mail quote which I just forwarded to sales to place an order. I just paid the invoice afterwards. Finally a (non) disclosure... I paid full retail for all their products. No samples or freebies. BTW, they sell some of their bearing materials in printer filament form. I'm using that for another project. 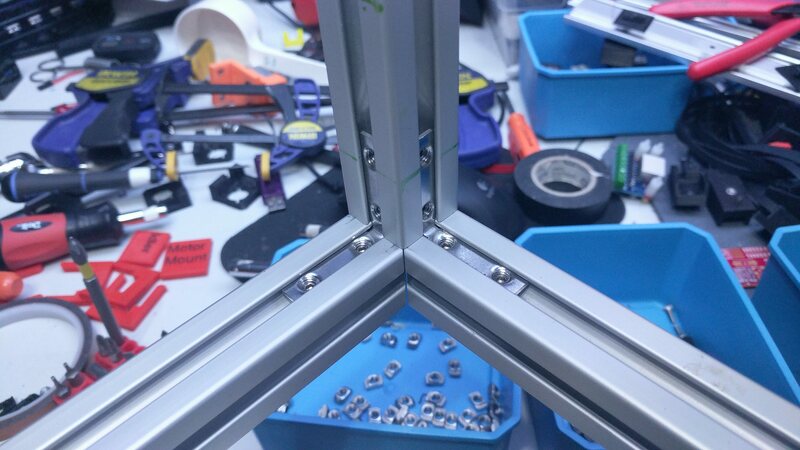 It had always been my intention to use 10mm carbon fiber tubes with Igus sleeve bearings for the center assembly. Then I realized I had extra linear rails and carriages and thought "Why not try them?" As it turned out, the mass penalty was only about 100 grams which I thought was reasonable. As you can see, both X and Y rails are oriented horizontally. This arrangement is much more compact vertically but I soon realized that those rails aren't designed to run unsupported in that orientation. There was just too much vertical flex. After a little expimentation, this is what I decided to go with. 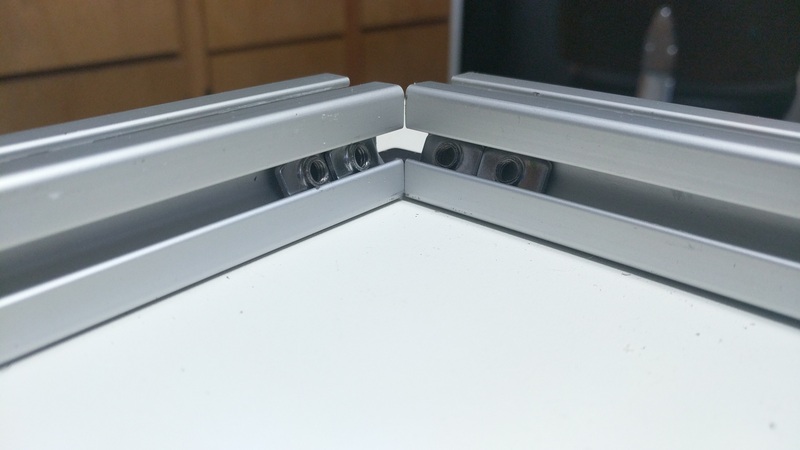 The bottom set of rails are oriented vertically providing strength but the top rails are horizontal providing better clearance for mounting the tool head. This is the underside of the center carriage. 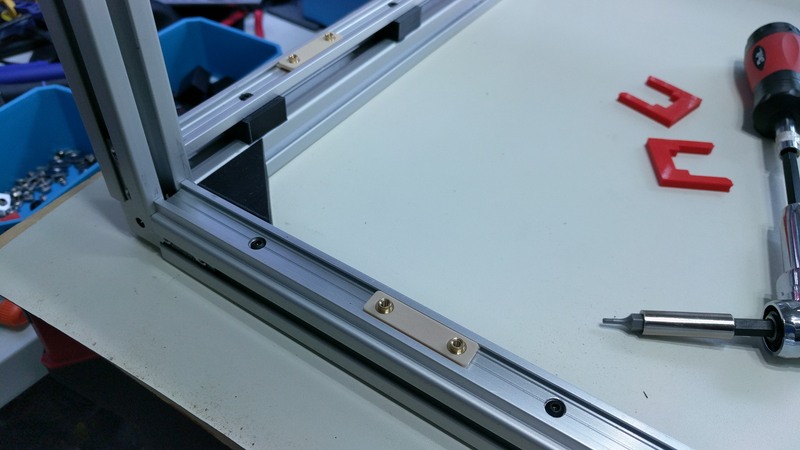 It has slots for the screws that attach the Igus carriages to the tool carriage so it can be adjusted. I've also been thinking about running the whole thing upside down. 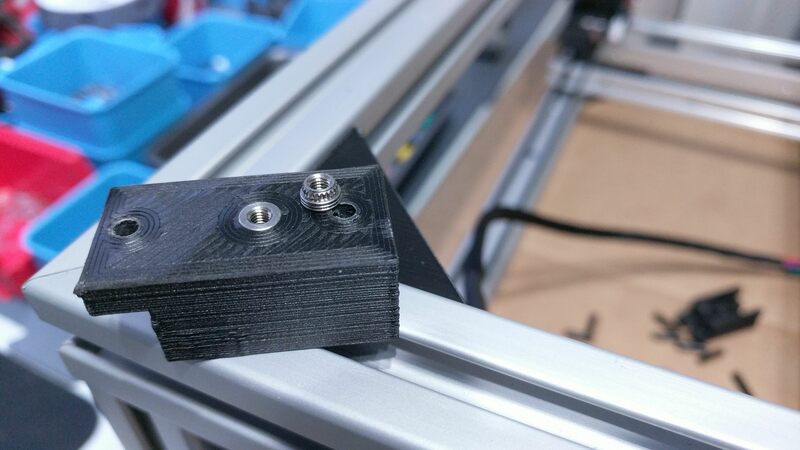 A note about the plastic: Except for the Y/Y1 perimeter rail spacer blocks, it's all Proto-pasta High Temp Carbon Fiber PLA. It's great to work with once you get settings dialed in. Next up...XY motors and idler pulleys. I like the aesthetics of carbon rods more, but that's just me. I really like your design, but I think that is more of an Ultimaker's kinematics evolution than "Hypercube Evolution" .... evolution. Edited 1 time(s). Last edit at 02/12/2018 04:20PM by stamos. I kinda like it as well. I can easily go back to the rods but I can also black-anodize the rails. Actually, it's more of a 40 year old X/Y plotter evolution. Yes. Each axis has two steppers. One to move each end of the cross rails. It should be more apparent in the next set of pictures. When I get it back to the point where it can move again, I'll do another video. 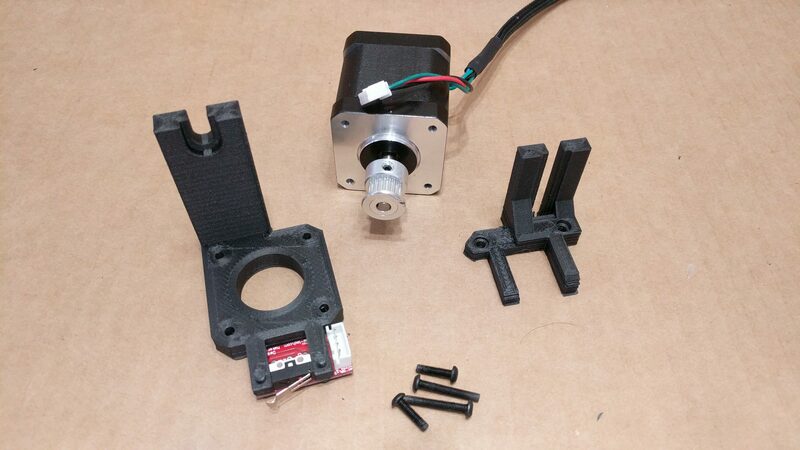 The motor mounts were printed in 2 pieces because there was no way to print them as 1 piece. Proto-pasta High Temp Carbon Fiber again. I did have to do a little cosmetic surgery to the limit switch. 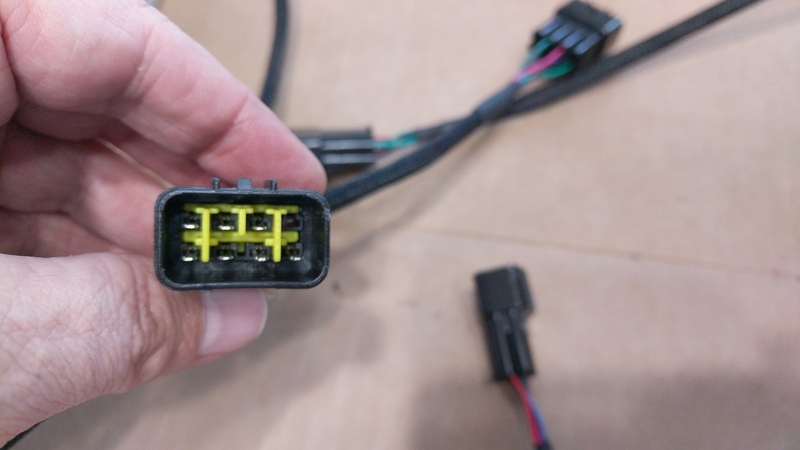 The connector is usually horizontal so I carefully bent it upright and trimmed off the extra PCB with a Dremel. 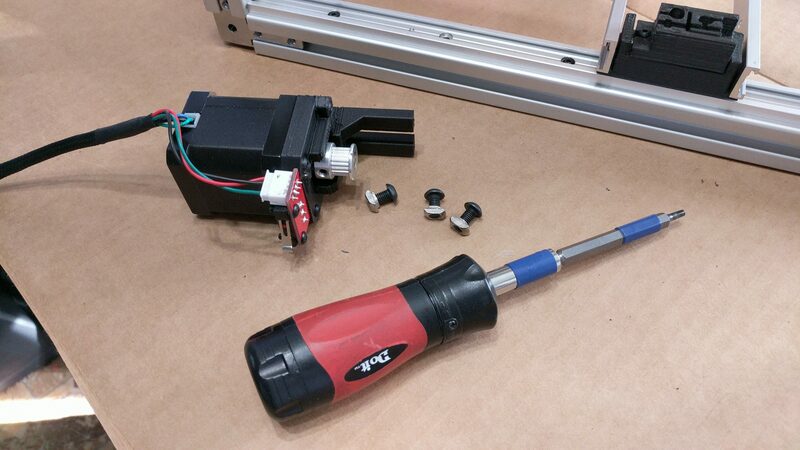 The bottom piece screws through the top piece into the motor and forms a tight assembly. 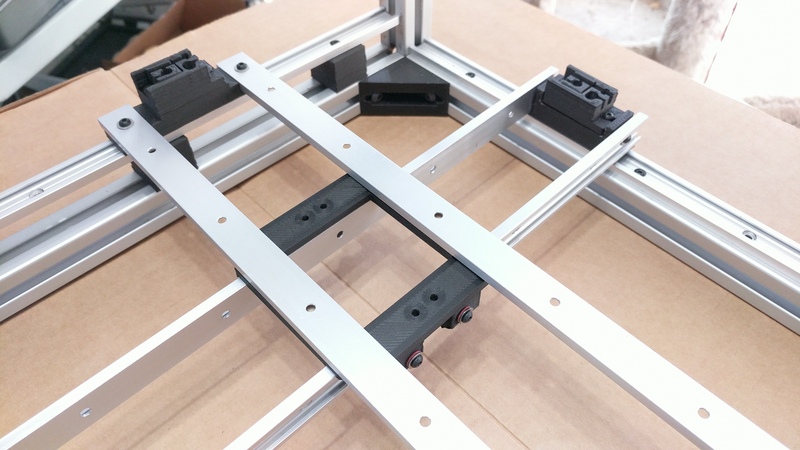 When the bottom piece (the gantry is on it's side) is down against the rail, and when the outside edge is aligned with the extrusion, the assembly is perfectly placed. 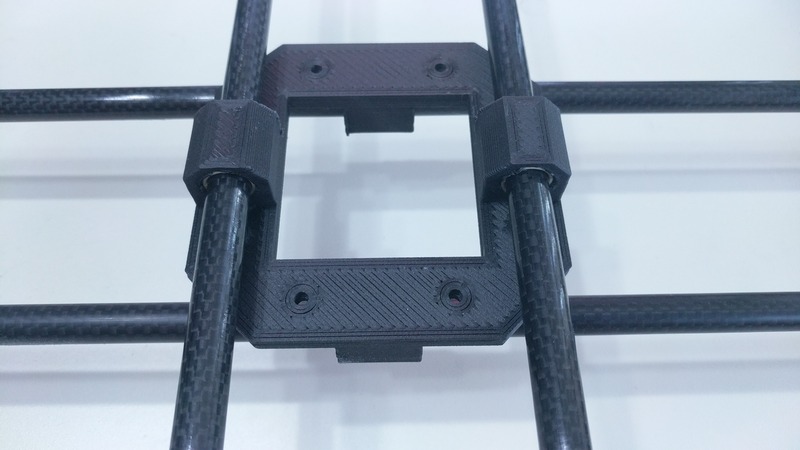 The idler pulley assemblies are actually 2 5x16mm bearings pressed into the carbon fiber bracket with a locking collar above and the pulley below. I forgot to take pictures before I assembled them, sorry. They mount and align like the motor mounts. The belts are standard GT2 6mm wide. This is one of the tensioners. Here's a look at the motor end. That bottom motor mount looks a little ragged and I need to re-print it. 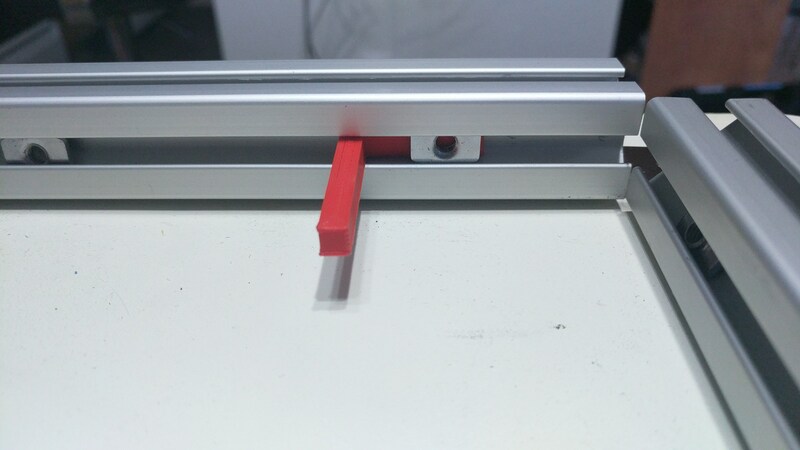 You can see that the slider actually slides under the spindle. I want to mention that wherever I need to join something to plastic, I use these M3 press-in nuts. I print the holes so they're stepped 3.5mm, 4.5mm, 5.5mm then tap those nuts in. Actually into the carbon fiber, it's more like pound those nuts in. This particular nut is how the end-stop trigger/belt tensioner cover will attach. You can see the end stop trigger/cover here. Next up... connectors, wiring and electronics. Your motor- and idler mount has not the best mounting to fight against belt tension. I photoshopped a suggestion to use the T-slot as a second snap-in support. It's funny, I've received comments on the motor mounts from some non-knowledgeable friends wondering why I needed such beefy mounts just to hold the motor up not realizing that the primary forces are belt tension and rotational torque. Nothing can extend beyond the perimeter of the frame because the frame has to slide inside the outer frame. Early on I did have a wrap around design towards the inside but it was a pain to print and the part that wrapped around made positioning of the idler bracket problematic. I did some experimentation though and wound up increasing the thickness of the structures from 5mm to 8mm, adding the bottom bracket to the motor mount, and using a wider spacing between the 2 bearings in the idler bracket . That, and the carbon fiber, made the structures impervious to normal operating belt tension. I even tested with a wire loop in place of the belt to see how much I could tighten the wire before things went wrong. It was much more tension than I could ever apply with a belt. BTW, if you've noticed, I left the idler shafts long rather than trimming them down. That's because I was measuring the distance between the top of the shaft and the frame to see how much flex there was when tightening. Same for the slight gap between the motor body and the mount. 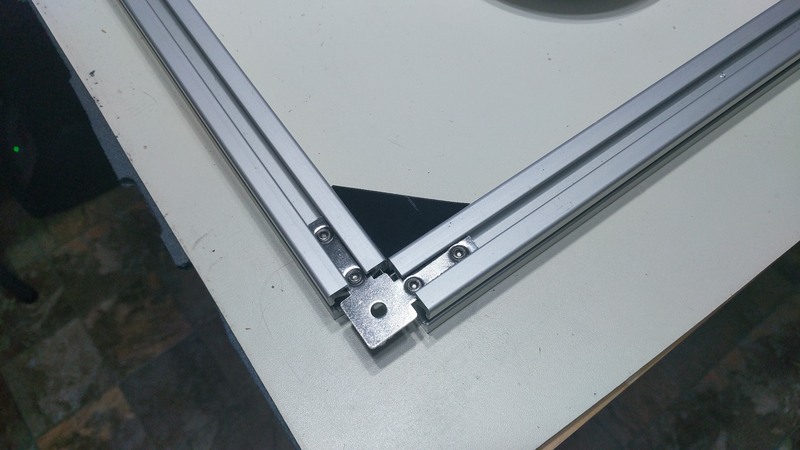 Your design has the motor attached to a relatively thin vertical blade that is attached to thin bottom plates (it sort of looks like an i3 printer frame). The belt tension is going to apply a twisting force to the motor and the blade is going to twist. 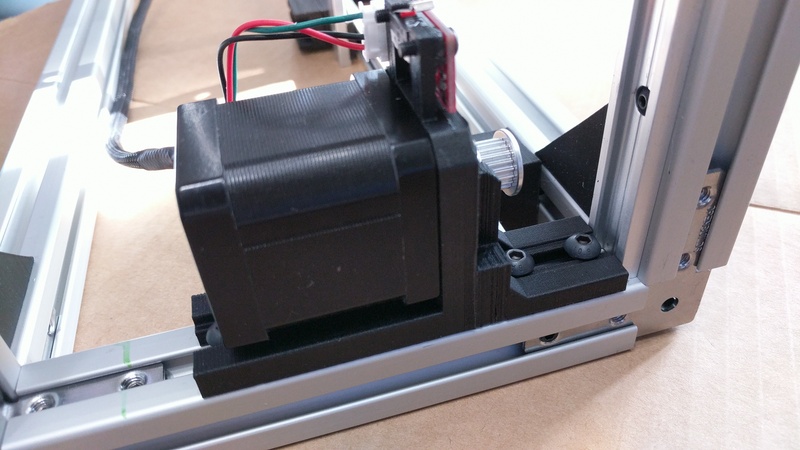 If you want to make a solid motor mount that fits in the space you have allotted for it, forget the piece that goes under the motor- it isn't doing much. Mount the motor on a block of plastic that has holes cut in it for the pulley and belt. That will be much more solid, and it will be easily printable in a single piece. 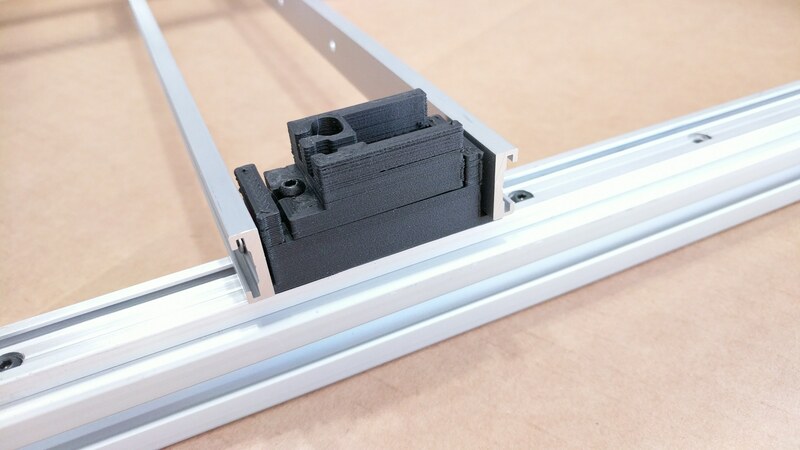 Designing a part like this is easy- start with a solid block, make a hole for the motor shaft and pulley, cut a couple holes in the side for the belt and so you can get a tool in to tighten the pulley's grub screw, then make holes for mounting it on the printer frame and to mount the motor. Leave in as much plastic as you can, because it all contributes to the rigidity of the mount. If you really work it right you might even be able to screw the block to both the horizontal and vertical frame members. 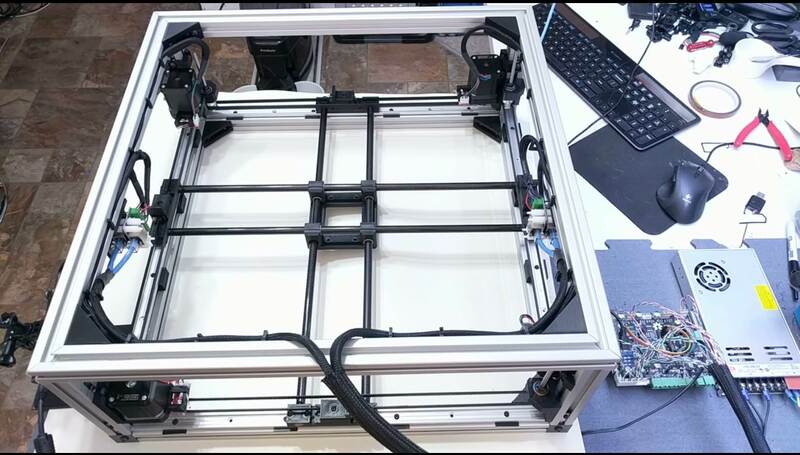 This is like a cube type printer frame compared to an i3 type frame- the cube is far more rigid. Edited 3 time(s). Last edit at 02/15/2018 11:09AM by the_digital_dentist. 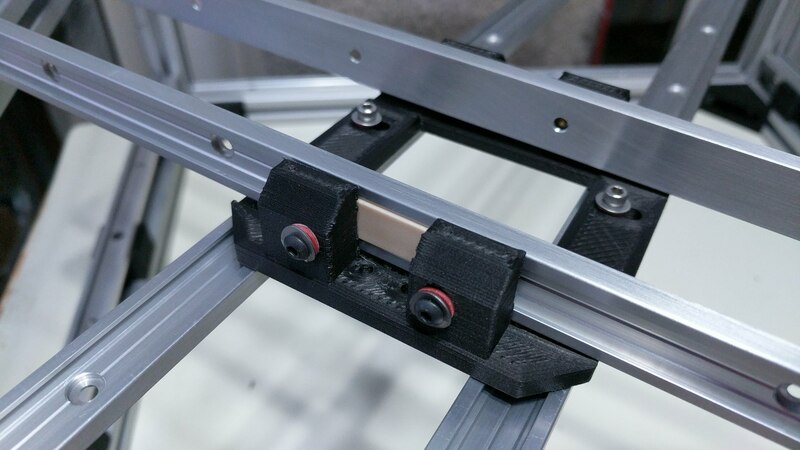 Your design has the motor attached to a relatively thin vertical blade that is attached to thin bottom plates (it sort of looks like an i3 printer frame). The belt tension is going to apply a twisting force to the motor and the blade is going to twist. 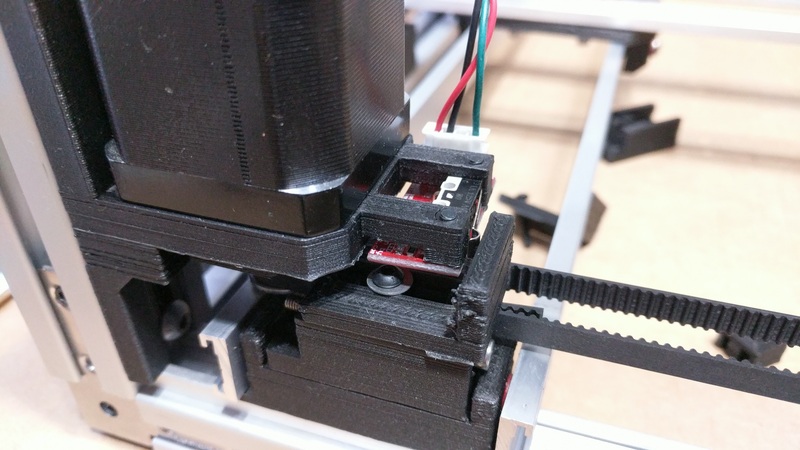 If you want to make a solid motor mount that fits in the space you have allotted for it, forget the piece that goes under the motor- it isn't doing much. Yeah, that was a concern early on. 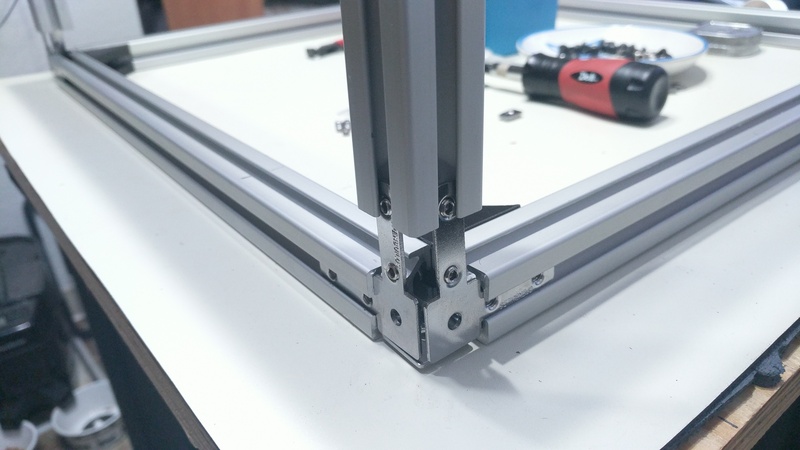 To keep the motor body inside the frame perimeter, the shaft is offset from the centerline of the frame mounting holes. In practice though. since the bottom bracket screws up through the horizontal plate into the motor and it's all carbon fiber it's pretty rigid. The proof will be when I restart dynamic testing of course so I'm not going to claim there isn't an issue. The other reason for that bottom bracket was so I can mount the motor to the plate before mounting the plate to the frame. Currently there are no frame bolts hidden behind the motor. Mount the motor on a block of plastic that has holes cut in it for the pulley and belt. That will be much more solid, and it will be easily printable in a single piece. If I do it this way though, I lose printable area because the sliders and cross rails won't be able to pass under the motor mount. However, you've given me an idea. 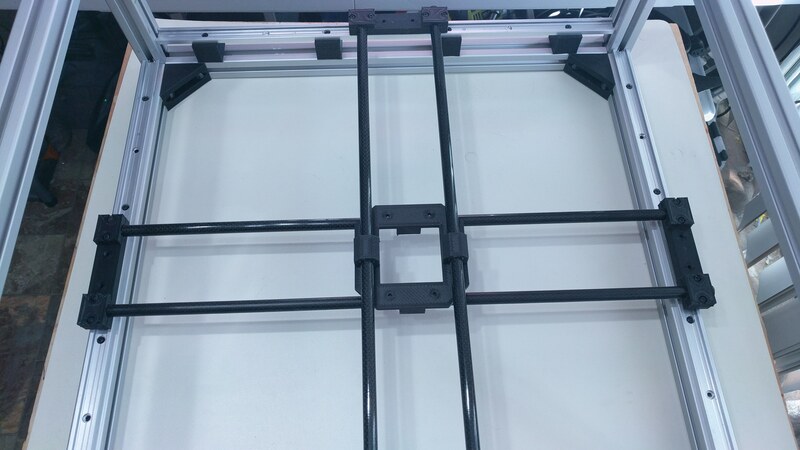 I may be able to extend the horizontal plate around the inside corner and bolt it to the other face of the vertical frame extrusion without interfering with the idler pulley on that other face. In earlier designs I couldn't do that but maybe I can now. The idler bracket is much beefier and the shaft is closer to the frame so even though the shaft is still offset from the centerline there's no flex at all. I'm starting to appreciate IGUS rails more and more. The standard Hiwin MGN12' and MGN15 rails work fine for me but with bearings and grease and weight they seem so complicated compared to IGUS. I assume IGUS is much quieter? Edited 1 time(s). Last edit at 02/16/2018 08:07AM by MatthewHall. Oh yeah, they're much quieter. I'll do a short video this weekend without the belts attached and you can take a listen. If you're thinking about going this route, I'd suggest getting a short length of rail and a carriage or two just to test with. A half meter of the 17mm wide rail and 2 carriages will run about $30. They have larger sizes of course if 17mm is too small for your application. How come you choose not to make it more massive/box-like? Like DD suggested? Seems unnecessary to build such a strong frame and then add what in my mind looks like a weakpoint. If it doesnt hinder the function I would try to add mass to that mount to prevent flexing/distortion. The box-like structure would prevent full travel of the sliders. The addition of the gusset and the wrap-around attachment makes the mount super strong. I printed one last night (carbon fiber, remember) and there's absolutely no flex. If I thought I had a perfect design, I wouldn't have bother posting here so two cents are always appreciated! The Digital Dentist DID get me thinking again, as did you. I'm sure this won't be the last design. Hopefully I'll be able to run stress tests again starting tomorrow. The carbon fiber material is fantastic. It's about $70/kg though so it's not cheap. It has a higher glass temperature than standard PLA and with heat treating at 100C for about an hour, it's even more rigid. 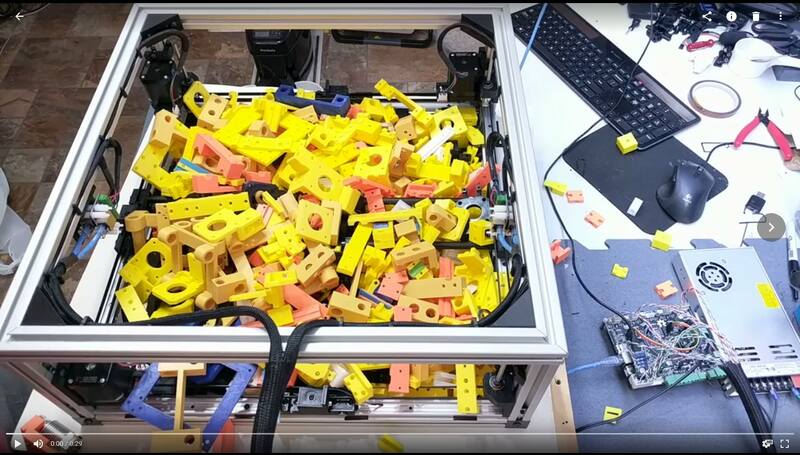 If you ever intend to enclose the printer to print ABS, or there's any chance it will ever get left in a hot car, you might want to reconsider use of PLA based filament (CF or not) for the printed parts. Well, it'll be too big to fit in my car! Proto-plant claims that when heat treated, this material "maintains it's properties" to 120C but yeah you're right, I wouldn't trust it in a heated chamber without a bunch of tests. Maybe what I'll do is when I've got a completely functional printer, I'll print a complete set of parts and set them aside, then enclose the frame and test print a bunch of ABS parts. [smile.amazon.com] $17 for a set of 5 8-pin M/F connectors. I used a not-quite-matching crimp tool but the matching one is only $20. They're a little large but they go with the "OverKill" theme. 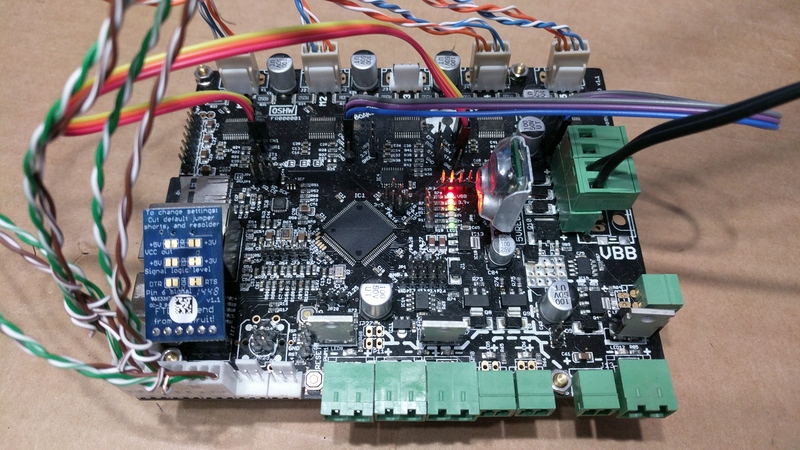 I'm using a Smoothieboard v1.1 with 5 stepper drivers for testing. Each of the 4 motors is powered by its own driver. The STEP, EN and DIR inputs to the alpha(X) and beta(Y) drivers are jumpered to the inputs of the delta(X1) and epsilon(Y1) drivers so whatever happens X also happens to X1, etc. 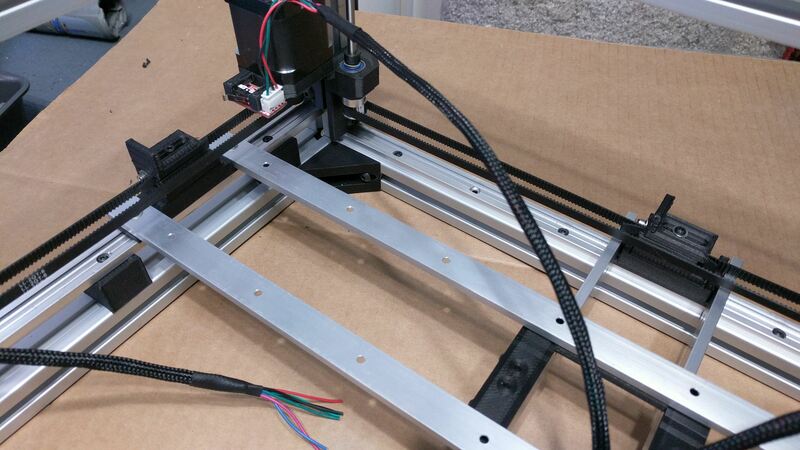 In the final build, I'll be using offboard TMC2130 drivers so I won't need to tie up 2 logic paths for each axis. If you look closely to the 4 motor outputs at the top edge of the board, you'll see X, Y, spare, X1, Y1. You may notice that the blue/orange pairs are reversed on the X1 and Y1 outputs. That's because X1 has to spin the reverse of X and Y1 has to spin the reverse of Y. Yes, that's CAT6e twisted pair. 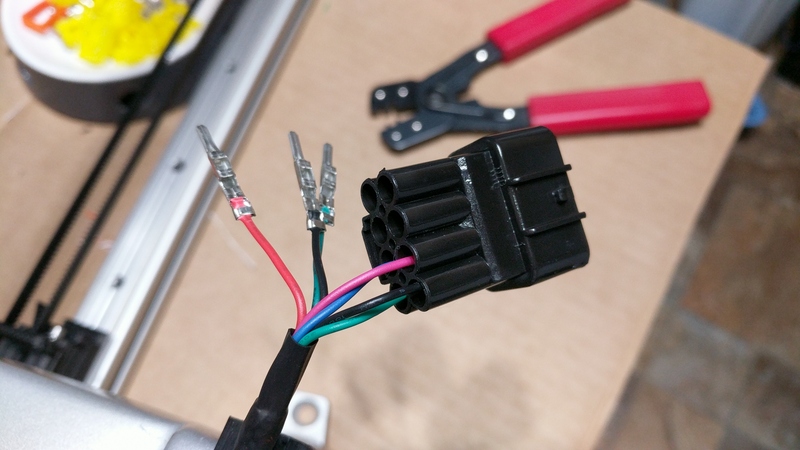 It's 23 gauge solid which is fine for the 1.5A max current for the short length. 4 pairs works well since there are 2 for the motor and 2 for the endstop and the fact that they're twisted can't hurt since the motors are driven with an ac-like waveform. I'm thinking that for the final build, I may mount the TMC2130s on the motors themselves to make the high current path shorter. We'll see. That's really it for the electronics. Next up... Another redesign of the XY cross pieces. You’ve changed the kinematics, technically that’s no longer a hypercube. Where did you get the carbon fibre rods? Did you cut them yourself ? Is there a reason why you’re not using 1 huge diameter carbon rod instead of 2 small ones. I do think 2 14mm diameter looks neater than 4 10mm just like ultimaker. Project looks good . 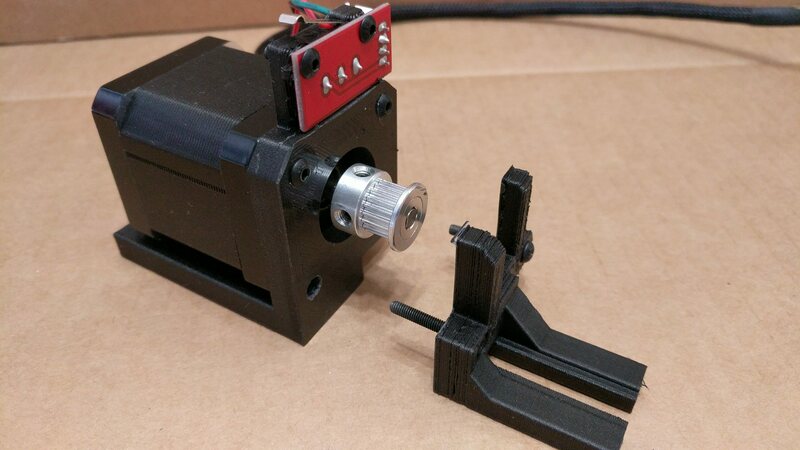 I’m so curious how the dual motor setup performance is vs a single motor with a shaft connecting both sides. Will it introduce artifacts to the print? It's big and roughly a cube. The carbon fiber rods I got from Amazon, pre-cut to 500mm. I didn't like the tool platform being offset from the intersection of the 2 axes when a single rod was used for each axis. 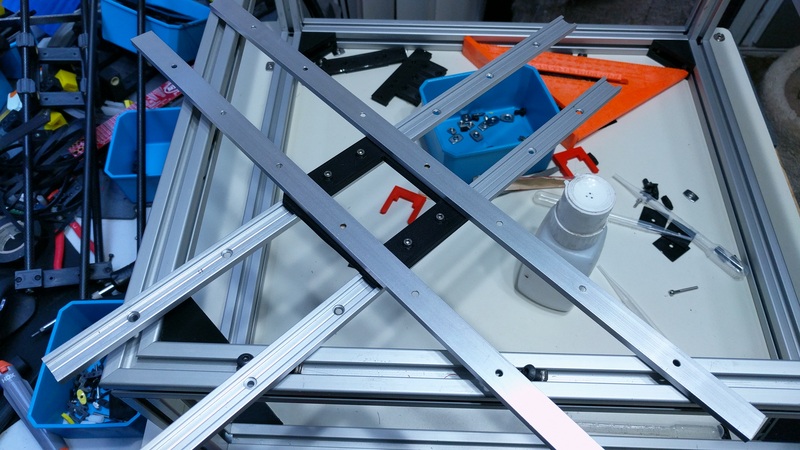 Having the tool platform in the center of the intersecting rods was much more resistant to twisting. I've already done some measurements and will document fully later but I had a test scenario with random XY movements and different speeds and accelerations, then a move to a fixed location where I had a dial gauge clamped. Each cycle lasted about 30 seconds and I ran it for over an hour and was never more than 0.010mm from the expected location. As long as the motors don't stall, they should be fine. The TMC2130 drivers I'll be using have stall detection so at least I'll know if it happens. For this test, I had the motor current limited to 1A and they didn't stall. Well, if they did, it didn't affect the positional accuracy. That is just a polymer trolley in a c shape aluminum. No strength at all in these tracks and are meant to be tied down to structure. Would be neat to know how the hold up? Flexing and trolley wear? What is your take on these linear rails? I have no idea about them, other than that they look "unbeefy", but maybe used in pairs they'll be OK. 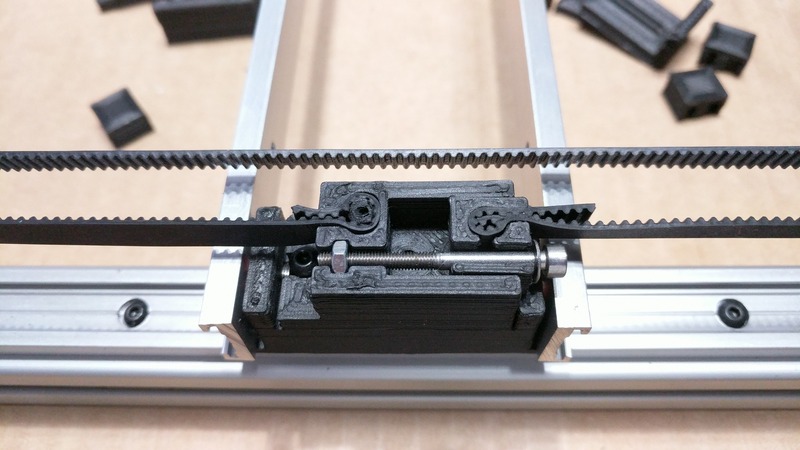 It would be interesting to see a dial gauge on the extruder carriage swept over the bed surface to see if there's excessive sag when the extruder is at the middle of the bed. 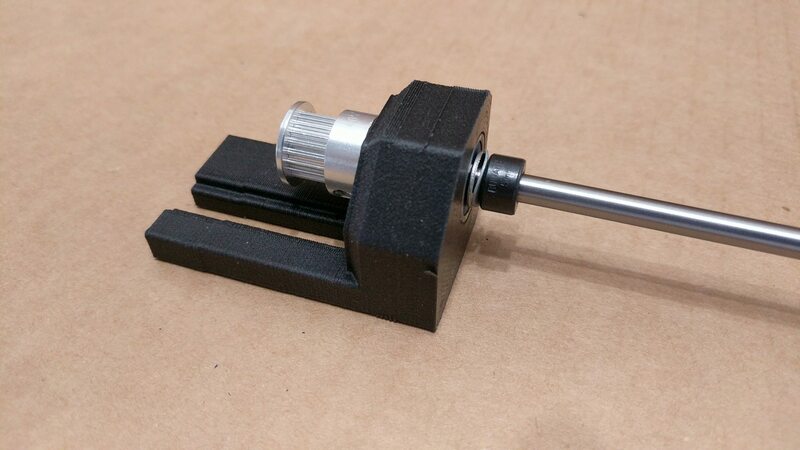 I'm not a big fan of plastic bushings in general, but if you're trying to make a high acceleration/speed machine you have to reduce moving mass somehow. 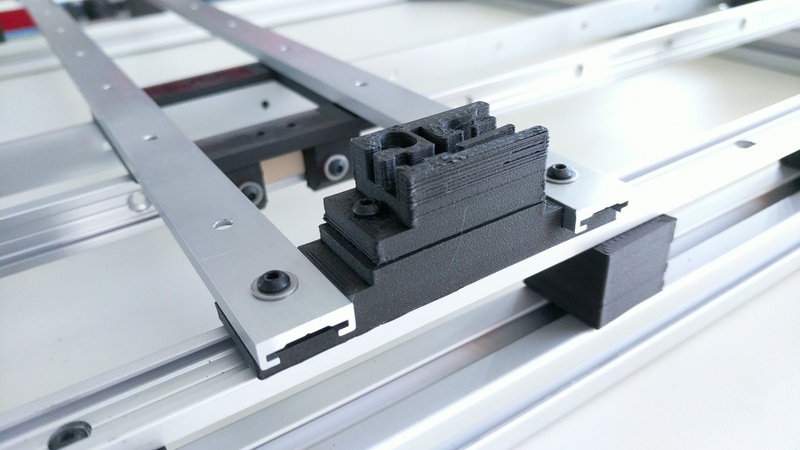 I've seen printer mechanisms that run at high acceleration and it looks impressive, but making extrusion work so you get a quality print is whole different problem. I'm on the road this week for work but when I get back, I'll do a sweep with my dial gauge attached and some load places on the tool platform. The problem will be that, since I don't have a Z axis yet, I don't have a reasonable bed to measure against but I may be able to rig something up by using another piece of extrusion. 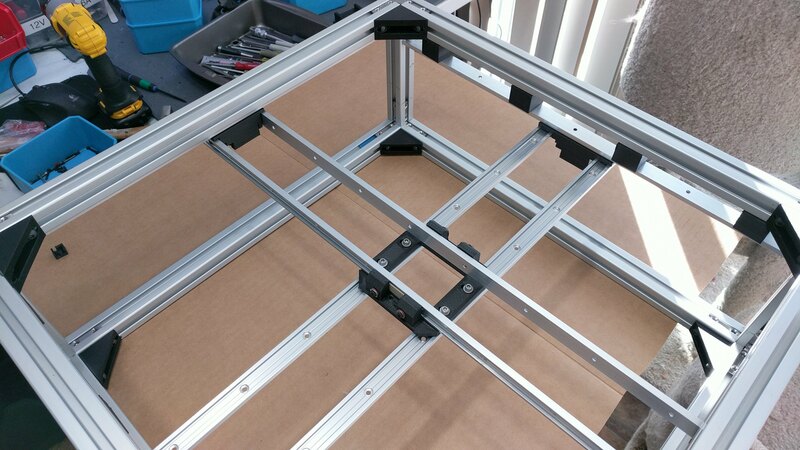 With 4 rails supporting the center tool platform (2 X, 2 Y), is's pretty stable in the Z axis but it'd be good to measure. 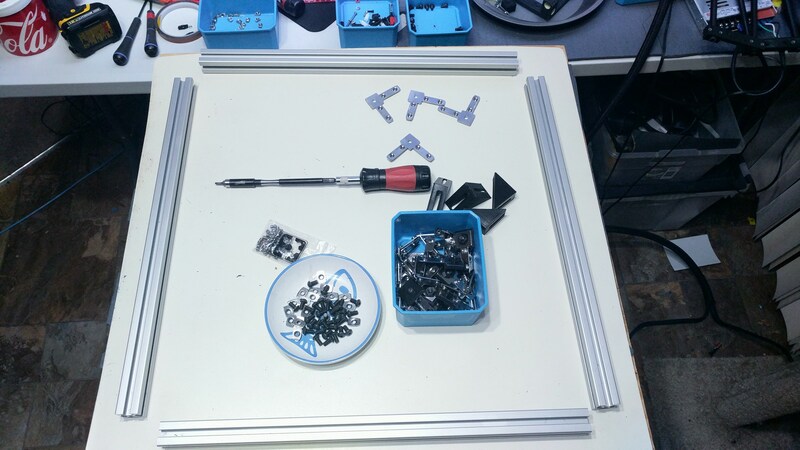 There won't be an extrusion motor or even fans on the platform, just hotend, extrusion drive gear and ducting, plus whatever load the umbilical adds. The umbilical load will be somewhat dynamic though. What I'm thinking is 2 lightweight silicone tubes, one carrying part cooling air plus the electrical stuff, and the other carrying hotend cooling air plus the filament. The cooling air would then have to pass by all the cables in the silicone tube? Or is it a tube_in_tube design?